When Upper Columbia Academy in Spangle, Washington, decided convert its gymnasium into a venue for its spring gala, Principal Eric Johnson, knew the existing hardwood gym floor may cause acoustic concerns as well as a less-than-ideal look and feel. That’s when he began researching temporary floor covering that would be more appealing for special events such as this and came across Greatmats’ Gym Floor Covering Carpet Tile. Impressed by their sound deadening qualities, durability and easy installation, Johnson says his school also uses the protective carpet tiles for graduations, parents weekends and concerts. The carpet tiles get their heaviest traffic during graduations, which typically hosts about 1,000 people in the gymnasium. At the fundraising gala’s, they’ll place tables and chairs on the protective carpet where they’ll feed the approximately 400 people in attendance. With plenty of help from the students, Johnson says it takes anywhere from an hour to an hour and a half to cover approximately 12,000 square feet with the just over 3×6 foot tiles. While Johnson said the tiles have done a great job protecting the hardwood underneath, that’s not the primary purpose for which they purchased the flooring. ”We bought them for aesthetics and the sound deadening,” Johnson said. UCA, a private Seventh-day Adventist coeducational Christian boarding school in operation since 1945, draws students from all over the country is well known for its vocal and orchestral music programs, which as produced the likes of international classical singer Thomas Hampson. And Johnson said, with the new Gym Floor Covering Carpet Tiles, it greatly improves the acoustics in the gymnasium when they are having concerts. Lisa is the principal designer for Vonn Studio in Charlotte, NC. She has used a variety of our specialty flooring products for her projects for various customers. 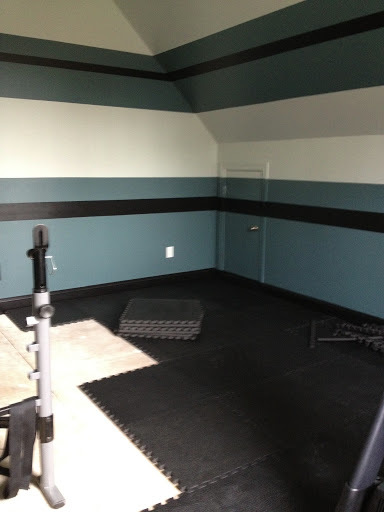 Lisa used our Ergo tiles for this gym flooring. 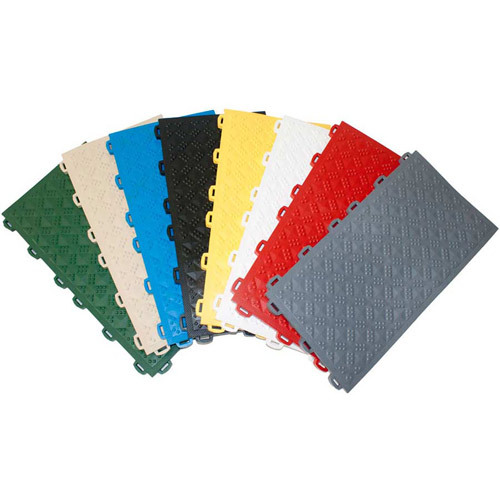 Ergo is a flexible modular plastic floor tile that comes in a variety of colors. It is made of 100% recycled materials and, because it mixes PVC with rubber, it’s very resilient. These modular floor tiles are guaranteed for five years. Ergo is often used as an outdoor playground surface area for younger kids where fall heights aren’t a huge concern. Ergo is easy to install and care for. It requires no glues or special surface to attach it to. Just snap in together and you’re done! Pebble mats are fantastic foam flooring product that is so dense and rugged we are able to use it in horse stalls. However, it is soft and provides a great cushion so people enjoy using it in their home gyms or workout areas. Lightweight, it can usually ship via ground carrier and is much easier to move around and work with than heavier rubber tiles or rolls. Like the Ergo plastic floor tiles mentioned earlier, Pebble Mats are a breeze to install. Just lay them out and cut to fit with a straightedge and a sharp utility knife. The se foam floor tiles measure 2ft x 2ft and are 3/4” thick. They are great for areas with light free weights and other equipment. They come with a one-year warranty and two border strips per tile. They are waterproof also which can come in handy. Thank you, Lisa, for the kind words and the wonderful photos! If you have questions or would like to discuss the possibilities for your area with one of our professional specialty flooring representatives, we hope that you’ll give us a call. We would love to help you find the product you need to make your project a success. Samples are also available upon request.